"My boyfriend-turned-fiance absolutely FLIPS over these....hopefully you will enjoy them as much! 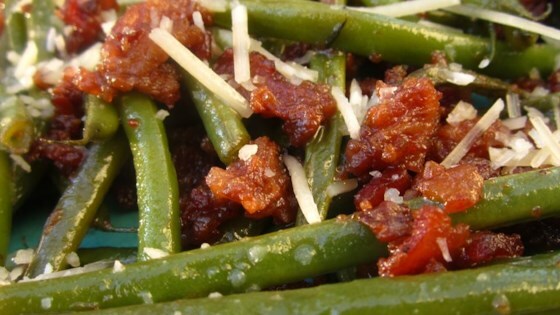 Fresh green beans simmered with bacon, garlic, and onion, then joined with bread crumbs, seasonings, and cheese to create a wonderful side dish!" Cook and stir the bacon, onion, and garlic in a large skillet over medium heat until the bacon has just started to brown, about 8 minutes; mix in the balsamic vinegar, water, salt, black pepper, and green beans. Reduce heat to medium-low, and simmer the green beans until almost all the liquid has evaporated, about 10 minutes. Stir in the bread crumbs. Remove the skillet from the heat, and sprinkle with Italian cheese blend. Adjust salt and black pepper to taste. Very good recipe! I would suggest par boiling the green beans before adding to the mixture. Maybe it was my beans but--they were a little tough! These were very tasty, but the breadcrumbs were a little strange to us. I may make this again, but will probably skip the breadcrumbs the next time. I dont think the flavor of these beans is enough to warrant all the extra fat added to them. They were pretty good, but I think I'll opt for healthier next time. I made it with Asparagus. No, I would not make it again.